It takes years of experience to become knowledgeable in how to clean upholstery. Unlike carpeting that typically is made from one type of material, or some time two different fibers, upholstery is commonly made up on blends of different fibers, often two or three. With these different blends in fibers as well as different weaves many common problems can be encountered during the cleaning process including, bleeding of colors, color loss, shrinkage or browning to name a few. This is what can happen with an inexperienced upholstery cleaner. For years our customers have trusted us with some of their finest fabrics. We take great pride in being able to clean fabrics that most cleaners don’t dare touch. We also carry protective coatings that will aid in the prevention of the possibilities of damage to your upholstery from an accidental spill or stain. As an independent professional, we can provide you with the truthful facts on the many different types of protective finishes there are today. These protective fabric treatments many times can prevent damage to your upholstery from your attempt to remove a routine spill. See our “ Fabric Protection “ for more information. At Alec’s Carpet & Upholstery Cleaning we offer quality, full service upholstery cleaning that refreshes and cleans your furniture completely. Our complete treatment removes all dust, threatening stains, dirt, allergens or harmful microorganisms without disrupting the natural or original qualities of your pieces. We proudly employ only certified, highly trained and the most experienced technicians that really know how to clean upholstery. They offer you years of hands-on experience with all types of fabrics and materials. They give you a quality clean, backed with in-depth knowledge. We clean all types of fabrics and furniture style with precision and confidence. We give you the clean you need and deserve for all your upholstered furniture. Our trained technicians treat all upholstery textiles with individual attention. We confidently clean micro fiber, silk, wool, leather, linen, chenille, cotton and suede without causing damage to the natural quality of the fabric. We clean all furniture styles including couches, love seats, arm chairs, chaise lounges, sectionals, window seats and ottomans. 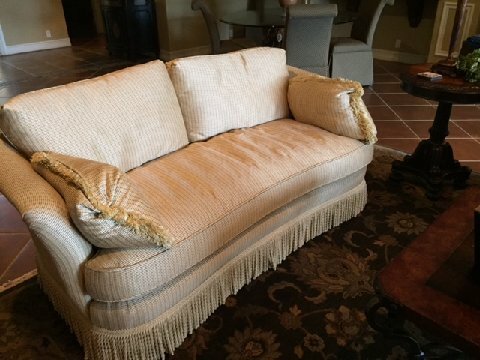 We clean deep into the folds and crevices of all furniture as well as all sides and backs of all the upholstery. Our upholstery cleaners are completely self-neutralizing, non-toxic, hypoallergenic and biodegradable. They will not leave any residue and leaves colors brighter and whites whiter. Our upholstery cleaner are carefully chosen for their compatibility with upholstered fabrics as well as their ability to remove the stains, soils, body oils and salts from perspirations which all will weaken and discolor fabrics if left to long on fabrics. Alec’s Carpet & Upholstery Cleaning also uses environmentally friendly alternatives instead of the use of solvents to safely clean your fabrics that manufacturers recommend dry cleaning to if at all possible since most upholstery can be safely wet cleaned but care must be taken not to over wet or be to aggressive in the cleaning. This is why it is so important to look for someone who is trained and with years of experience in this art of cleaning. It is also recommended by us as well as most furniture manufactures to professionally clean all upholstery every one or two years depending upon its’ level of use. Yes we truly know how to clean upholstery. Over the past 40 years, we have cleaned tens of thousands of pieces. Whether you need a Boston upholstery cleaner, Wellesley upholstery cleaners, Weston upholstery cleaners or you live north or south of Boston we can give you the expertise your looking for. Call Alec’s Carpet & Upholstery Cleaners today.